We had the great pleasure of field-testing the new Beastie Buggs recently. 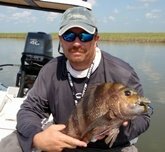 We met up with Heath right before leaving for a fishing trip to the marshes of South Louisiana. He wanted us to check out his deliciously irresistible new design. He said they would look more alive in the water than anything he's ever tied. He wanted them to look like little saltwater creatures, with fur and claws and rubber legs. When he put them in our hands, we were immediately intrigued and excited. They looked absolutely fantastic! But would the fish think so? He also told us the name he had already picked out for the Bugg. To our surprise, we were unimpressed. As we headed East, we were hoping inspiration would strike and a name would come to us on the trip. Read on to learn about the trip and how we came up with the name Beastie Bugg! Loaded for Bear, or Beasts! We took four colors with us: Blue Crab, Natural, Night's Watch, and New Penny. We wanted two darker colors for murky water and two lighter colors for clearer water. We also packed multiple rods and reels, our “portable” tackle bag, fly fishing stuff, lots of cold weather clothes and our little East Cape Fury poling skiff. We were armed to the teeth, so to speak. Too much stuff! Turns out all we really needed were the Buggs…and maybe a topwater or two and a couple of jackets. Thomas and I both tied on our new Beastie Buggs that first day on our lighter rods and while we fished with a variety of gear on our other rods, I don’t think either one of us took the Beasties off the whole time we were there except to try different colors. All of them worked and worked well! We were fishing in marshy, saltgrass areas in depths of 6 inches to 3 feet. The bottom varied from thick layers of decomposing grass and woody mud to harder, sandier, light colored muck. 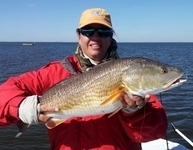 It made for great observation of redfish feeding behavior and reaction to the lures. 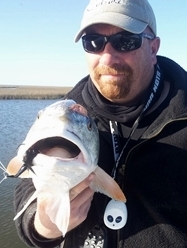 The reds were very visible to us from our poling skiff so we could see the fish eat the Buggs. Over the woodier bottom, which was very soft and easily stirred up by reds and mullet, we found that the Night's Watch and Blue Crab colors worked best. They were able to see the darker colors and just nailed the lures. Typically, we were casting 6 inches in front of the reds when we saw them and most of the time the strike was fairly instant. It was not necessary to be very subtle in the muddier water. We were able to cast and move it fairly vigorously. The fish weren’t spooked by the Beastie Buggs. Often if they missed finding it on the first cast they were more than ready to pounce on it on the second cast. Over the lighter colored bottom areas, which typically were shallower with clearer water, the lighter colored Beastie Buggs were most effective. The fish were a little bit more spooky or at least more suspicious of the lures. New Penny and Natural were productive but required a little bit different presentation. We had to cast a bit farther away from the fish, a foot or two or even more. The fish weren't actively feeding, and casting within inches of them seemed to put them on alert that something was amiss. Leading them with a cast in an intersecting path worked wonders! They looked for it in the water after hearing it hit. However, they typically didn’t like much movement of the lure. And here's a situation where Buggs really shine! At times we would slowly drag it across the bottom, and at other times we would just let it sit. The Beastie Buggs, with the bunny and rubber leg combination, look alive in the water even at rest! As the fish came cruising up to it, we would give it a subtle twitch and the fight was on! 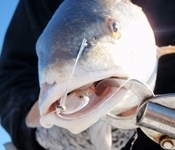 Another great thing about these lures is that the fish get hooked in the corner of the mouth or right up near the front. This makes hook removal easy and is easier on the fish. 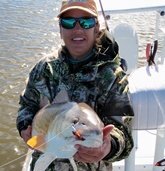 We did not have a single redfish or black drum swallow the hook or get it into their crushers. Heath tells us that this is due to the construction of the jig head and the flat eye hook he uses. On these jig heads the thump of the strike is easily felt, which allows for an immediate hookset and then the fight is on!! 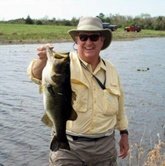 Buggs, and the Beastie Buggs are no exception, hold up well and it is very normal to fish all day with one, rinse it off and let it dry overnight, and resume fishing with it the next day and the next. I couldn’t resist casting at sheepshead and black drum as well. 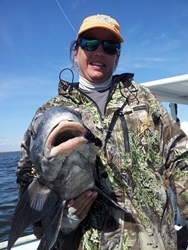 The black drum, some of them huge, were taking the Beastie Buggs as readily as the redfish. After a time, we quit trying to actually catch drum and had a great time enticing them to follow the Buggs right up to the boat before pulling the lure away. I didn’t land any sheepshead this trip. Had I been a bit more determined, I could have had multiples as they were most interested in the lures. 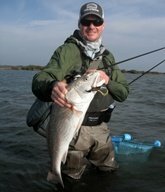 We did have several redfish that completely ignored the Beastie Buggs or were a little bit spooked by them, particularly in the clearer water. And it may have been that we cast too close to them. However, good news for those finicky days…we were often able to get these fish to eat! I remember a particular one that we probably cast to 10 times and on the 11th it ate. I also had one that ate the same Bugg twice! I caught it, released it and as it was “leaving”, it slurped up my Bugg that was dangling off my rod in the water. Surprised the heck out of me! 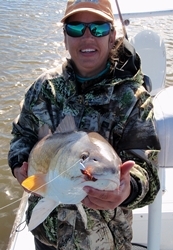 If you get a chance to fish the Beastie Buggs, we know you'll be glad you did! Thomas and I don’t fish with them because Buggs Fishing Lures is a sponsor. We fish with them, and have done so for years, because we LOVE them. We have proven over and over the effectiveness of Buggs and the new Beastie Buggs are no exception. They have the same fine Bugg quality, sturdiness and the same irresistible qualities. Head to the Buggs Fishing Store where you'll find a huge selection of Beastie Buggs! Thomas and Kaylin Barlow are valuable members of the Buggs Fishing Pro Staff. We're glad they volunteered for the tough task of sight casting to huge redfish with these lures!